Dulwich 12 ‹ Series 10 Reversions ‹ Flog It! Antiques programme. Paul Martin and experts Michael Baggott and Kate Bateman get stuck in valuing people's antiques and collectables at Dulwich College in London. Browse content similar to Dulwich 12. Check below for episodes and series from the same categories and more! Today, we're south of the river at Dulwich College. Dulwich is known for its beautiful Victorian park. Outside the splendid gates, you'll find Dulwich Village itself. even though we're just a few miles from Central London. The sun is shining, everybody is happy, smiles everywhere. And we've got a whopping queue today. Everybody here at Dulwich College is eager to get inside. who are already starting to value items in the queue. who has a passion for silver. I'll tell you one thing, it's over 46 years old. and works for the family auction house in Lincolnshire. Be still my beating heart. You get a sticker. You get two stickers, just in case I miss you. Somebody here today is going home with a lot of money. I guess, as I'm the senior member of the team, I can be the headmaster. So let's get the doors open and get on with our lessons. Kate has delusions of grandeur. ..I might have a Kate Middleton moment. Is it going to go? I feel I should beat out a tune on this wonderful drum. Marvellous! And auction fever has us all in a spin. Kate's at her table with a cheeky monkey and its owner, Patricia. -Patricia, welcome to Flog It! You've brought a little person, a little monkey. Who is he? I don't know what his name is. He hasn't got one. that we found in the loft when she died. -No. Where she got it from, I'm not sure. What intrigues me... I looked at his face and he looks familiar to me. He's got a little hole in his ear. which would mean he was Steiff. I think, just looking at him, I'm fairly sure he is a Steiff. Date wise, he's pre-war, certainly. Probably about the 1920s. He's had a bit of a hard life. He's straw filled. He's mohair. You can see he's obviously had some quite long bits here. He was obviously this fantastic, all-over brown colour. -Any idea, price-wise, what you think he's worth? Well, Steiff's one of the big names. But he's not in good condition. I think he's probably £50-£80, something like that. Although he's missing his button, but he is recognisable as a Steiff. -Is that the kind of figure you'd go for? I look at him and I think, "I don't really like him." No? He's got a sweet little face! -He's just been sitting in the cupboard. It should be the least that you'd be happy to sell it for. So if you say, "I'd let him go for £20, I'd be happy with that,"
and let him find his own level at the auction. -Thank you for bringing him along. to get his hands on some silver, courtesy of Gillian. Look at this wonderful thing that you've brought me. 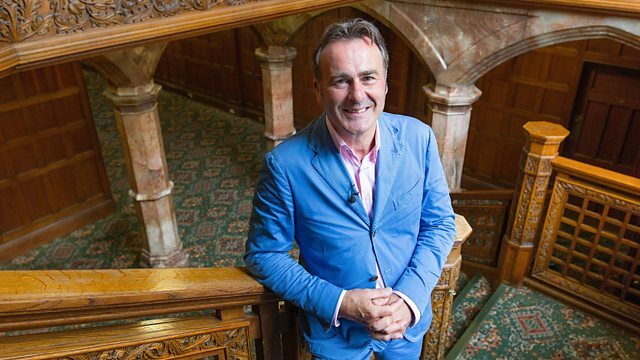 I'm always delighted to see a piece of silver on Flog It! Before I tell you anything about it, where did it come from? When I cleared out Mum's flat, when she died, I found it. I didn't know anything about it at all. -So you'd never seen it up until that point? Any idea where your mother got it from? No. It could have belonged to my father's side of the family. Silver's very helpful because it's usually marked. What we need to do is flip it over. And we've got those hallmarks there. Three little marks. Have you looked at them under a glass? I have. They didn't mean anything really. The first one is the assay master's initials. and the testing to see that it was up to standard. Next to that we've got an "84". which is the Russian standard of silver. So we can tell from this it's Russian. -So we know that this was made in Moscow in 1863.
but unfortunately I can't tell you who that is today. If we tilt it back up, that's the clue as to where it comes from. It's a typical drinking form. They had a lot of beakers. This flared foot is more unusual. Often they tend to end in just a cut foot. which is fantastic detail, and it's engraved. you get these wonderful black lines, almost like a black enamel. That throws up the contrast of all the decorations. which I can't translate for you. Those are the initials, in Cyrillic, of the owner. It would be fascinating to know how your mother really got it. He was in the Royal Marines. I think we may have our answer. Well, it's a lovely thing. -Why have you decided to part with it now? -Well, it's in a cupboard. Nobody seems that interested in it. -You're not a big vodka drinker, are you? You couldn't have that much on a regular basis! -The good news is that Russian silver is very collectable. when Russian oligarchs were spending millions of pounds. -but we'll keep that reserve fixed. from Moscow or St Petersburg. -Might be hoping too much, but we'll see on the day. I think it will be keenly sought after whatever. Thank you so much for bringing it in. magpie Kate has jewellery on her table, brought in by Elizabeth. -You've brought some pretty rings. -My husband gave them to me. when you have to let go a bit. No, I've got very many rings. Did you wear them? Presumably. Yes, I did. I wore them to many functions. -He took me out quite a lot as well. -Showed you a night on the town! There's some really nice ones here. so he's obviously bought quality. You're a lucky woman! These front three here have all got diamonds in. This one is a sapphire and diamond one. That's just on 9-carat gold. they've had a bit of a resurgence really in fashion. It just shows how the Royals are still setting the trends. but it's become a lot more easy to sell now. So I would say, maybe try these three. Individually, they don't have very large diamonds. but the largest is about a third of a carat. around the outside with little cuts in it. into thinking the diamond in the middle is bigger than it is. and then put the sapphire as a separate lot. For these three together, you're probably talking £120-£180. And maybe the same sort of thing, so 100-150, for the sapphire one. -Would you want a reserve on that? OK. Your reserve needs to be a bit below your low estimate usually. -and maybe an £80 reserve on the sapphire. -I'd like £100 on the bigger one, if you don't mind. -My husband paid quite a lot of money for it. -I know it's going back a bit, but he did pay quite a lot. that's the entire point of a reserve. -So 100 firm on this one and 100 on the three. And estimates a bit higher. -Brilliant. Thanks for bringing them in. I might just have a Kate Middleton moment. Will it go? -So glad I did my nails! I think so. -And it's the right size. -My husband will be sweating. and he wants to find out more about his family heirloom. Thank you for bringing in this curious box. I think we might be able to guess what it is before we open it. What a magnificent meerschaum pipe! Look at that handsome fellow. It was my grandad's and my dad passed it to me when he passed away. -Did your grandfather used to smoke it? Good grief! When would he have had it about? What time? We have a little silver collar as we do with the best meerschaum. And it's got the marks for Birmingham around 1895. They're a little bit discoloured. I can't exactly make them out. But that would tie in perfectly with the style of the pipe and the box. And you've just got this fantastic capped and bearded gentleman. someone's bit the amber mouthpiece off which is a bit of a shame. But it's still a super thing. as people have moved away from smoking and smoking paraphernalia. They are little works of art in their own right. -that it's just wonderful, isn't it? that really deserves to be in one of the best collections. not the most popular, not the most commercial. or figures, or examples with scenes carved round them. and they make between £400, £500, £600, £700, £800. is just a plain meerschaum with a little bit of carving - £30, £40. You're somewhere in the middle with this. Any idea of the value then? -and hopefully, we'll go above that top figure on a good day. -So if you're happy to put it into the auction...? We'll do that and fingers crossed, it does really well. around one of our valuation tables. We'll find out later what the bidders think. Let's hope we have a good result at auction. Next to the Thames, we've headed to Greenwich to sell our items. But first, Tony's pipe is about to go under the hammer. in its original case, £60 to £100. -You're the odd one out, Paul. so people will put their hands in the air for this. -It's sitting around doing nothing. -It was one of Dad's things from his father. -No, he was just a hoarder. but these things used to fetch good money. They used to be £300 or £400, but those days have gone. and think it's a really fine quality carving. And it's a bearded gentleman, so I've got to have it! I love the way Robert sells things. Looking for 55 on this pipe. It's worth all of that. 55. 58. £60, I'm out. Looking for 65. I've got 60. I'm looking for 65. -It's better than losing it somewhere in the house. Patricia's Steiff monkey's about to go under the hammer. and now it's in the auction room. -It belongs to Tricia. Hopefully, not for much longer. Why do you want to sell this? It wasn't mine. It was just in the loft. -You found it in your loft? -It was my late husband's mother's. -I was thinking maybe the previous owners left it there. Good luck, Kate. Good luck, Patricia. This is it. Two-tone brown. Lovely little chap. Looking for 25. I've got 22 on it. Looking for 25. 26. Eight, I'm out. £28. Looking for 30. I've got 28. Looking for 32. 32. I'll take 34. I'll take 34 on the phone. 36 in the room. 38, I need. 38, I want. 38. £40 there. Looking for 42. 42 I need. On the phone at 42. 44 in the room. 46, I'll take. -Room against phone, isn't it? £50. I'll take 52. Four, I need. Six, I want. 56 in the room. £60, in the room. I'll take 62. 62, I want. 62. 64 in the room. Not monkeying about, is he?! 66. No? Are we all done? Last time. On the monkey at £64, on the Steiff. You were worried to start with. I was. He was damaged and didn't have his Steiff button. But he had the look. Much better than expected. Someone loved that monkey. Gillian's silver goblet is ready to go. Good luck. OK? First auction. So many of our owners, it's their first auction. But first auction with a lovely Russian beaker. You can't beat that! What is it, Moscow, 1863 or something like that? We couldn't find the maker on the day, but I have looked it up. There are two makers using those initials. One is Ivan Alexeyev, but he's too late. And the other one, we don't know his name, so we're not much further on! Did you find out the writing on the top? -No, I don't think we translated it. -We do know it's £200-£300. It could go for more. This is it. It's going under the hammer now. and the bid's with me at £140. Looking for 150 on this. I've got 140 on it. 150. Looking for 170. I've got 160. I'm looking for 170. The hammer's gone down on 160. We had a fixed reserve at £200. -So we didn't sell it. Thank goodness there was a reserve. -Disappointing for your first auction. and if you bought it in Bond Street, you might be paying £500. Thank goodness we put that reserve on it. -It is a good day out on Flog It! come to one of our valuation days. You can pick up details on our BBC website. Follow the links. All the information is there. And, hopefully, we're coming to a town very near you soon. Well, the goblet didn't sell. But will Elizabeth's diamond ring stand a better chance? and we have four coming up right now. They belong to Elizabeth. Originally in two lots. you valued separately, which is kept separate. The other three, the auctioneer has decided to split up. Yesterday, he said he thinks the others are quality as well. And we could fly through that estimate. Fingers crossed. The jewellery buyers are here today, so hopefully they'll go. It's going under the hammer right now. Good luck. The bid's with me straight away at £38 only on this ring. Looking for 40. I've got 38 on it. Looking for 40. 40 I've got. Looking for 42. Are we all done? 42, it's at. Looking for 45. I've got 42. Are we all done? Last time. 42. The first one's gone. Bid is with me on that at £30. Looking for 32 on that one. I've got 30 on it. Two, four, five, eight. 40, I'm out. Looking for 42. 42 there. Looking for 45. I've got 42 here. Are we all done? Last time. At £42! with a sapphire, heart-shaped stone and platinum shank. Size "K". Absolutely sweet little ring this. And the bid's with me at only £38 on it. 40. Two. Five. Eight. 50. I'm out. Looking for 52? I've got £50. Are we all done? Looking for 65. Are we all done? Last time. lady's, diamond cluster ring with a beautiful sapphire stone. I like this one. The Kate Middleton ring. OK, the bid is with me at £85 only on this ring. Looking for 90. Looking for 100 on this ring. I've got 95. 100, I'm out. Looking for 105. I've got 100. Looking for 105. Are we all done? Last time. -That was good. It was the right decision. -That makes a grand total of £246. And I'm very glad to have been here. It's been a wonderful experience. -It's been a pleasure meeting you. Splitting the rings up separately paid off. around one of London's most famous landmarks. especially when you view it from the Millennium Bridge. You get an uninterrupted view. The only one left between those two modern pieces of architecture. This is my favourite building in London. I can't wait to explore it. To do that, we need to get to the heart of the building. but let's make a start somewhere. on this site, north of the River Thames, ever since the year 604. This is, in fact, the fourth cathedral to be built on the site. It's just celebrated its 300-year anniversary. it's had a thorough clean inside and outside. So come with me. Let's take a closer look inside. how dirty the building has got over the last 300 years. It's not surprising with the pollution in London. penetrating the very fabric of the stone. And this is what it looks like years later. at a cost of around £40 million, but it's been given a new lease of life. of the cathedral's architect, Sir Christopher Wren. Wren was a clever man, an achiever. and the Royal Greenwich Observatory. Both feature a domed design - a trademark element, some might say. The process of getting the designs approved took a long time. is an incredible six metres in length. when it was still in its planning stages. for featuring a Greek cross as the footprint of the cathedral. This is another representation of one of his designs. It really is truly incredible! He commissioned two joiners to make this. It took them a year. Now that is a staggering amount of money back then. Equivalent of a very smart London townhouse. And quite fittingly, this model is known as the "Great Model". that has gone into this. In there, you can just see the incredible amount of work. I'm surprised it only took a year for two men. are still marvelling at centuries later. This model's design was turned down by the dean and chapter. was given the Royal seal of approval. This building project took 35 years from start to finish. until its completion in 1710.
but was still heavily involved. so he could inspect the latter stages of construction. I've been wanting to show you this. of Wren's design for the dome. or should I say the heavens? such a huge architectural feature. The inner height of the dome is 225 feet. There are three tiers to this construction. The inner one, which we're looking at now. which is a construction of wood covered in lead. That's what's visible from the London skyline. and it's an incredible 64,000 tonnes in weight. There's a more quirky feature to this mezzanine balcony. It's called the Whispering Gallery. your voice will travel all around there. which is a distance of 100 feet, will be able to hear it. because as a young lad I came here on a school trip and tried it out. the pressure was on to make the interior as impressive. used by the dean of the cathedral. by respected woodcarver to the Royals, Grinling Gibbons. over the last 300 years since it was finished. and the marriage of Prince Charles to Lady Diana. isn't exactly how Wren's work would have been when he finished it. she was said to be not too impressed with the interior decor. drawing your eye right down there into that perspective. Mosaics depicting prophets and saints and gilding everywhere. Not just on the images, but on all the architectural details. making it dazzle, making it sparkle. with prayers every hour, several services a day. but from all over the world. and marvel at that ever-familiar dome on the London skyline. and there are plenty of items for our valuers to choose from. Michael has drummed up a treat from James. I feel I should beat out a tune on this wonderful drum. A marvellous thing. Can you tell me where it came from? Well, it came from the home of one of my wife's aunts. I've no idea. To us, we've called it a biscuit barrel. But it's not really very airtight. It isn't very airtight, but you're spot on. It is, strictly speaking, a novelty biscuit tin. Simply because it's modelled, very cleverly, as a drum. when you just add this very naive, surface engraving of the tensioners. to have the two strikes as the thumb piece. If we turn it over, we always have marks. Oh, that's nice. -Because it's not solid silver, it's electroplate. We've got the electroplate marks for GR Collis. These other marks are simply fake punches. you might think it was hallmarked and solid silver. but there are manufacturers in Birmingham as well. So this was probably made in Birmingham for their London shop. -I think we can go back to late Victorian. This is certainly going to be anywhere from 1890 up to 1910. -would be the de rigueur biscuit tin. Now the thorny question of value. We know it's not solid silver, sadly. Any idea what a drum-form biscuit tin is worth? 60. I think I'm with you there. I would put a fixed reserve of £50 on it. is it's the unusual things that tend to sell well. -Right. What about a reserve at 60? I don't see £10 either way breaking anybody's heart. Let's give it a go and we'll let the market decide what it's worth. Thank you very much for bringing it in. Irene, you've brought a little bit of the continent to Flog It today. Not a lot, except that I bought it in a table sale. -OK. You instantly fell in love with it? -I just thought it was interesting. -OK. What did you pay for this item? I never go to table top sales that have things like this for £3! I'm going to the wrong place. What do you know about it? and bring these back as souvenirs? Yep. It is, as you can see, the Roman ruins in Rome. I think the Arch of Constantine is what it's called. that somebody's put together to form this design. which was probably gilt originally. It's probably late Victorian, so you're right about the Grand Tour. to do a Grand Tour round Europe, and they got souvenirs. So it's about 100 years old, I would have thought. The work is amazing. -You obviously liked it. Did you wear it? Right. Quite a practical reason. -You're quite happy to sell it? -OK. It cost you how much? I'll give you a fiver right now! Let's do it. -Would you take that offer? -No, I'd like a bit more. I think at auction you're right to hold out. I would have thought about £50-£80. and they're a bit clunky. This is beautiful. I can't see any damage. Maybe a few tiny pieces lost, but otherwise it's really good. So estimate £50-£80. Would you want a reserve? -We put it below the estimate, so a £40 reserve? With the estimate at £50-£80. -And we'll make it a fixed reserve. -You're happy to give it a go? -Fingers crossed it will go. It's my turn to value now. I found Ken and Pat with their lovely watercolour. This looks interesting. Can you tell me anything about it? I've had it for about ten years. It belonged to my father. He loved collecting 1930s, 1940s paintings. I thought it was painted by a man. I knew he was something to do with the art school. That's about all I knew about it. is because HE is a SHE. It had me going for a minute. like you sometimes see a man's name printed. But, no, definitely a lady. where she was a pupil. She ended up staying and teaching there for 40 years. She fell in love with the history of costume. in this lovely, faded, watercolour, pencil sketch. Look at all the faces hard at work, concentrating. They've all got, more or less, the same shaped nose. in the Imperial War Museum. I know that they went and spent a lot of money on more of her work. that whole sort of 1930s period, and that sold for £150 in auction. So that's a good price guide for this. It's not a lot of money for such a nice image. No, it's not. I do like it very much actually. and I don't blame you really. -So put a fixed reserve on at £150? -You've brought in a nice vase. What do you know about it? So are you a collector of Doulton? -I have collected Doulton, yes. Where did you get this one from - antiques fair, market? No, I got it from a charity shop. -Tell me how much you paid for it. -I paid £6 for it. So it just caught your eye and you went for it? You, presumably, know as much as I do about it. It is Charles Noke. we can see he signs his items "Noke"
and, usefully, it says the word "flambe" on the bottom. It's exactly that - flambe ware. Charles Noke was a real pioneer. and brought these fantastic flambe wares, copying the oriental. this very deep red colour. Basically, he threw everything at this one. I mean, it's a really interesting piece. He's got, not just the red, but all these different colours. There's some yellow, sort of mustard colour. I'm not sure it entirely works. Yeah, I think it's beautiful. It only cost you £6. What do you think it's worth? I've got a fair idea of what it's worth. you're probably between £80 and £120. Maybe £100. Is that the kind of figure you were thinking of? Yeah. I'd be well pleased to get that. -That's quite a return on your money for £6. Obviously, that does affect the price. but nothing that's going to really deter a bidder. Just below your low estimate. and that's the same as your low estimate. Brilliant. Thank you for bringing it in. and see what the bidders think. and Paul's flambe vase is ready to go. Why are you selling this? You're looking very, very nervous. -Are you changing your mind? You got it from a charity shop. Good for you. It cost you next to nothing. Let's see if we can get you a fabulous profit. Here we go. in a flambe ware design with artist mark. Looking for 80 on the flambe ware. I've got 75. -It's your first auction, isn't it? Yes, I can tell. It's the nerves. Where's 80. I've got 70... £80. I am out. I've got £80 seated. Looking for 85. Are we all done? Look, I'll take 88 if I have to. I've got 85. Looking for 88. Are we all done? Last time standing. Are you sure? At £85! -That's a good profit for you as well. Now he's smiling, look. Yeah! From flambe to my find. Let's watch the Pegaret Anthony painting go under the hammer. -Pat and Ken, it's good to catch up with you. Are you OK? We're about to sell this wonderful Pegaret Anthony work of art. And it is quality, isn't it?. Let's find out what the bidders think. Ladies working in a clothes factory. Dated 1943. Signed by the artist. It's a lovely, lovely lot this. And the bid's with me at £130. Looking for 140. It's worth all of this. 145. I've got 150 on this. Are we all done on this watercolour? Last time. I'll sell it at £150. It's gone. It went on the reserve. I'd like to have seen the top end and so would you have done. Yes, I would have because I did like it that painting. -I'd buy it. It's beautiful. Good luck. It's going under the hammer right now. Lot 340 is the late-19th, early-20th century micro-mosaic brooch. And it's got to start with a bid with me of £45. £90. I am out. Looking for 95. 95 with the hand. 100 seated. Looking for 110. -Carry on, madam. Keep bidding. 130, new place. 140 seated. 150 standing. 160 there. Looking for 170. -Are we all done? Seated. Last time at £160. That was a great result. It was such good quality. Well done. 'That's a brilliant return on the £3 Irene spent on it. Just how will James' drum biscuit tin fare? Let's find out. It's just been wrapped up in a black cloth, keeping it out of daylight. -Have you given up the biscuits as well? You've got to have a few custard creams with your cup of tea! You can't give up the biscuits, Paul. I speak as a man who has tried on many occasions. with the engine-turned relief marks. GR Collis & Co, 130 Regent Street, London. It's got to start with a bid with me of £60. Looking for 65 on this drum. Where's 65? £70. 75. 80. -They love it, don't they? 200 here. Looking for 210. 210, I need. On the phone at 210. 230, I want. 230 on the phone. 240 here. -260 here. Looking for 270. 270. 280 here. Looking for 290. 300. They think it's silver, do they, Michael? The market for electroplate has obviously recovered. 400 here in the room. Looking for 410. 410, I need. 420 here. I wonder if it's going into some sort of military collection. -We're in Greenwich, aren't we? -450 - what have we missed? 500 here in the room. 540 in the room. Looking for 550.
and he's so reticent right now. -The words aren't flowing, are they? 600 here in the room. Looking for 610. Are we all done? Last time. At £600 on the drum! We're just going to see biscuit tins on Flog It! from now on. We'll see every biscuit tin in the country. Are you happy with that, James? and a perfect end to a wonderful day here in Greenwich. I hope you've enjoyed the show. I told you there was a surprise. Join us again soon for many more. But for now, it's cheerio! Paul Martin and experts Michael Baggott and Kate Bateman get stuck in valuing people's antiques and collectables at Dulwich College in London. Among their finds are an unloved Steiff monkey and a Russian silver goblet, but it's a biscuit tin that drums up a surprise result at auction. Paul also visits the historic St Paul's Cathedral to follow the story of Sir Christopher Wren's design.